Professor Rajendra Shrestha with his book on Environmental Resources, Social Issues, and Related Policies. A new publication titled “Thailand: Environmental Resources, Social Issues, and Related policies” has just hit the shelves. Co-authored by Prof. Rajendra Shrestha, Dean, School of Environment, Resources, and Development (SERD) at AIT, the 424-page volume is published by Nova Science Publishers. The book reviews the status of selected natural resources, paying special attention to environmental concerns, including forest resources, coastal and marine resources, protected areas and biodiversity, soil and land resources, water, energy, and climate change. While identifying key instruments and modelling tools for environmental management, the book analyses key management issues and policy options that can help safeguard natural resources in the midst of rapid and dynamic anthropogenic and environmental changes. “While economic growth and urbanization has helped lift millions of people out of poverty, these achievements have also had negative consequences for natural capital, biodiversity, ecosystem functions, and human health,” says Prof. Shrestha, reminding us that “we also face growing economic inequalities and disparities in regional economic growth.” “The book is an ideal companion for scientists, graduate students, stakeholders, and policy makers,” he adds. Prof. Shrestha’s co-authors are Prof. Yongyut Trisurat, Prof. Rajendra Prasad Shrestha, and Dr. Palle Havmoller. Prof. Trisurat and Dr. Havmoller serve in the Department of Forest Biology in the Faculty of Forestry of Kasetsart University, Thailand, while Prof. Shrestha is the Dean of SERD at AIT. 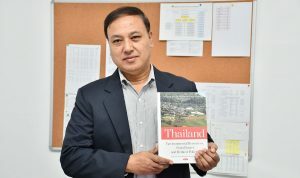 Divided into five sections, the 17-chapter book analyses physical environments and natural resources, governance and management, and global initiatives and economic tools and offers conclusions and recommendations toward an effective environmental resources management in Thailand.